Coming off a season that included a trip to the NIT and All-SEC First Team honors, Damian Jones returned to Nashville looking to solidify himself as an NBA prospect. Making the unusual decision to announce his intention to declare for the NBA Draft last October, some eight months before event itself, Jones figured to once again play a prominent role for the Commodores as the program aimed to return to the NCAA Tournament for the first time since 2012 and make some noise in what appeared to be a wide-open SEC. Posting slightly improved numbers in most key areas on a per-minute basis than he did as a sophomore, Jones scored 13.9 points and pulled down 6.9 rebounds per game as a junior. The former top-100 recruit came out of the gates strong, helping Kevin Stallings's team to a second place finish at the Maui Invitational, but like the Commodores on the whole, had significant ups and downs this season. He finished among the top-10 players in the SEC in points per-40 minutes pace adjusted, field goal percentage, and block rate among qualified players, helping Vanderbilt to a NCAA Tournament First Four appearance, where they were promptly dispatched by Ron Baker, Fred VanVleet and the Wichita State Shockers. Held to 5 points in that game as he was hampered by foul trouble, Jones earned All-SEC First Team honors once again, but didn't quite take the significant step forward that would have solidified his standing as one of the top big men eligible for the 2016 NBA Draft. Standing 6'11.5 in shoes with a tremendous 7'3.75 wingspan and a 244-pound frame that carries just 6.6% body fat, it isn't hard to figure out what makes Jones an intriguing NBA prospect on first glance. He may not be an Andre Drummond or DeAndre Jordan-level freak of nature, but has everything scouts look for in a center prospect physically, and a frame that still has room to grow. On top of his sheer size, Jones is also a good athlete for his size with a good mobility and explosiveness, even if he doesn't appear to be the most fluid strider running up and down the floor. Playing nearly the exact same role that he did a year ago, Jones averaged a very respectable 1.01 points per possession over 13.5 possessions per game as a junior, a side-step from the .992 he scored over 14.6 per game as a sophomore. Doing the majority of his scoring one-on-one on the block, the Louisiana native was asked to use his size to his advantage against smaller defenders and finish shots created for him in the half court. Not the most polished player in terms of his instincts as a scorer and passer, Jones was not asked to be particularly versatile for Vanderbilt. Finishing the year shooting an impressive 56% on the block, the 20-year-old big man doesn't have the most polished offensive repertoire, but his size, couple with flashes of touch on his turnaround jump shot and right handed hook allowed him to be quite effective in spurts creating for himself inside. Lacking much in the way of counter moves, Jones gets tunnel vision at times and his shot selection and feel for creating for himself isn't ideal, but as much as his game isn't pretty, it was quite efficient a year ago. Aside from his ability to score on the block, Jones did his best work by far as a finisher around the rim. Shooting 68% around the basket in the half court, the athletic big man is quick off his feet and can dunk the ball effortlessly. The limiting factor on Jones's effectiveness inside last season was how frequently he settled for difficult shots, brought the ball low allowing the defense to get into position, and didn't go up quite as strong as one would hope in traffic. To his credit, Jones didn't necessarily shy away from contact, as he got to the line for 7.7 free throws per-40 minutes pace adjusted. Unfortunately, Jones only converted 54% of his free throws last season, down from 61% a year before. His struggles at the line aren't surprising, as he made just 26% of his jump shots in the half court as well. Showing some flashes making jumpers out to 15-17 feet, but not with the kind of consistency you'd hope, Jones seems to have some upside as a shooter, but remains a long way away from being a reliable threat from the midrange. Similarly, he flashes the ability to put the ball on the floor an attack slower defenders driving to the rim, but often forces wild shots when he can't get an angle. On the whole, Jones isn't an incapable scorer, but he disappeared for stretches on the offensive end, which proved problematic on a team that could have really benefited from a workhorse scoring presence. Jones doesn't always impose his will on games, lacking a degree of toughness, intensity and assertiveness at times, but his ability to finish around the rim, draw contact, and make the most of his tools on the glass figure to be far bigger part of his role than his ability to consistently impact the game on the block. 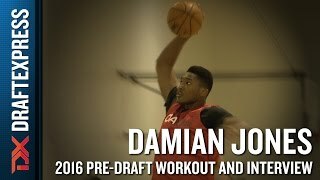 His skill level is still a work in progress and his feel and motor leave something to be desired, but we've seen a number of big men with similar physical gifts make significant leaps or find key roles at the NBA level with better coaching and player development than they found in college. The team selecting Jones will hope he can take a page out of former Vanderbilt big man Festus Ezeli's book and grow into a rotation player. Defensively, Jones is a bit of a mixed bag. Blocking a solid 2.5 shots per 40-minutes pace adjusted, Jones has some impressive flashes rejecting would-be scorers, but doesn't have great instincts contesting shots on the ball and isn't always as physically aggressive as you'd like a player his size to be around the rim. His instincts and passivity on the defensive glass are a more consistent issue as he pulled down just 7.1 defensive rebounder per-40 minutes pace adjusted, the fourth lowest mark among the 13 centers ranked in our top-100, behind a number of players with far less impressive physical profiles. Jones has the quickness to step away from the rim and defend the perimeter fairly impressively in spurts and the strength to hold his own in the post, but he frequently gets caught in no man's land, is a step slow with his awareness, and doesn't show great anticipation. Jones clearly has the physical tools to be a factor on this end, and the flashes of potential he shows leave some room for optimism, but his instincts are still catching up. Frustratingly inconsistent at times over the course of his three-year collegiate career, Jones is a one of the younger prospects in our junior rankings at just 20 years old. An Engineering Science major who has consistently been lauded for his intelligence off the floor, the flashes of good things Jones showed, coupled with his physical tools, give him the type of upside that could lead a team to bet on him in the mid to late first round. A late bloomer of sorts (RSCI #91), they'll hope he can begin to develop the kind of mean streak and consistency that would help him make better use of his physical tools as he enters his 20s, as players in his mold often develop later than most. Analyzing the November 19 matchup between Vanderbilt center Damian Jones and Stony Brook's Jameel Warney on both ends of the floor, with a particular emphasis on their head to head possessions. Video by Jon Giesbrecht.